I was looking at all my Anne Rice books and I noticed one of them didn't look like it had been read. 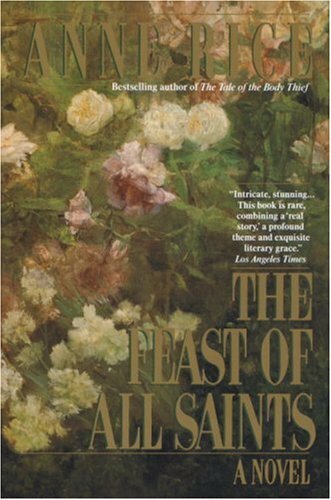 My best guess as to why I hadn't read The Feast of All Saints when I bought it is most likely because of the very small and heavy font. Anyway, years after purchasing it, I have finished reading this book which was quite different to her vampire series. The novel has a familiar setting in New Orleans, however there are no vampires or supernatural themes in the story. Set in the French Quarter in the 1840s the novel is about the gens de couleur libre the free people of colour, neither black nor white, and living in a city with slave markets and black servants. This was a real eye opener into the times and challenges faced by the gens de couleur, and the struggles they faced. The main character is Marcel, although the reader is treated to an in depth analysis of several 'sub characters' and much family drama is covered in the book. I was surprised by some of the themes and it really made me think. How could women of colour look down upon women who married other men of colour for love? Instead it was expected that young women of colour would strive to be the mistress (second wife) of a white plantation owner who would only visit the city every few months. Essentially this meant knowingly being the wife/mother of a second and secret family. Unbelievable. There is a lot of family drama, questions of lineage, family traditions, society expectations and when it's okay to break the rules. To be honest I struggled during the first 100 pages (there are 636 pgs in total), however the story really picked up after that and I was hooked. It was such a treat to read an earlier work of Anne Rice (one of my favourite authors), as I'm hanging out for her new book.